Margot was at The Duke Of Cambridge Celebrates The Royal Marsden party earlier today wearing a simple – but gorgeous – silver and grey gown. You can check out the HQs in the gallery below. 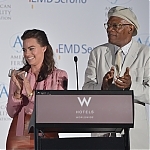 Yesterday, Margot was a guest speaker with Samuel L. Jackson at the American Fertility Association’s Illuminations LA Event. She looked absolutely gorgeous and hopefully we’ll get to see the speech she and Samuel gave because it definitely looked like Margot thought it was funny! You can view images in the gallery by clicking the link below. Don’t forget, Margot will be attending the MET Gala’s Annual Costume Ball tomorrow and she’s being dressed by Diana von Fürstenberg. We’ll have HQs up in the gallery as soon as possible tomorrow.